To understand the causes of the April 1968 Race Riots, the Greater Kansas City Mental Health Foundation commissioned Robert Bechtel and Charles Wilkinson to write The Social History of a Riot: Kansas City, Missouri, April 9-13, 1969. The 1968 Riot Collection includes the complete manuscript of that book, as well as many of the interviews conducted by researchers. Interviewees included witnesses, protest participants, and members of law enforcement. There are four interviews with African-American members of the Kansas City Police Department who served during the riots. While Social History focused on these officers’ perception of racism within KCPD, the interviews paint a more complex picture. The relationship between black officers and the black community was often contradictory. The officers sympathized with civil rights protestors and felt the indignity of racism, but their sympathy for violent rioters ran out quickly. They also had a complex relationship with their fellow officers and superiors. In short, these men expressed conflict between their own identities as black men, their loyalty to their department, and their duty to uphold the law. Major Garrison and Sergeant Walter Parker were interviewed together. At the time of the interview, Parker had been a member of KCPD for 19 years. Both men complained that even when off-duty, people knew they were officers. This could be nuisance, such as friends and relatives who wanted their tickets taken care of. It could also be serious, as when Black Panther militants threatened the safety of Parker’s family. Another interviewee, Leroy Swift, was called a “house n*****” by another black man. This insult carried a specific connotation of a black man placed in a position of power as tool of white supremacy. Interestingly, Swift said the man later admitted the insult was just for show. Parker described a similar dynamic: “I realize that it’s necessary for [Black Panther activists] to stay away from the police and call the police names and not have anything to do with them in order to keep [their movement] going.” According to Swift, many black officers in KCPD at this time were “black first and policeman second.” Being “black first” meant having some sympathy for activists. Parker and Garrison were united in calling for a constructive conversation between police and activist groups. However, they were skeptical that activist groups actually wanted to have those conversations. In other words, these officers were suspicious of militant activists, yet still empathized with them based on certain shared experiences. The activists might have shared a similar mixture of emotions. Despite the lack of productive dialogue with activists, these officers felt they had strong ties to the African American community in Kansas City, and that these ties helped them succeed at their jobs, particularly during the riots. 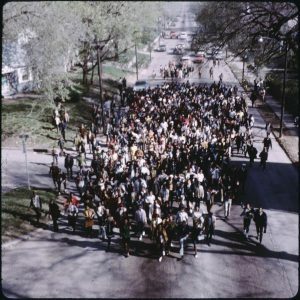 During the riot, “Tuckie” Saunders and two other black plainclothesmen helped one group of student protestors make an orderly march and demonstration. At one point the students asked Saunders to make a speech. The group Saunders was with seems to have been separate from the more volatile crowds. Saunders had his own method for dealing with disruptive protestors: “if [Saunders] had been in charge…he would have dispersed the kids with streams of water” because “it was cool that morning and when your clothes are wet you have to go home and change.” Saunders may have believed is method more efficient and humane than the use of mace or tear gas, which police employed during the riots. Captain LeRoy Swift had a leadership role among officers facing the more violent protestors. At the very start of the riot, Swift and two other black officers pursued a group of black students who looted a store in plain sight of the officers. Swift speculates that the students thought the officers would look the other way because they were also black. The students were wrong. According to his account, he was later sent in to help calm things down between white police and African-American protestors. To do so he overruled some arrests made by white officers. Swift also described how some whites believed the police-enforced curfew did not apply to them. Every officer interviewed expressed support and admiration for KCPD Chief Clarence M. Kelley. Saunders said he “was good as gold” and Swift called him “a good man” and “honest.” In contrast, Kelley’s command staff drew universal criticism from the African American officers for being racist, “biased and sneaky.” What was missing from KCPD, according to Saunders, was “black faces in high places.” Swift described a lack of sensitivity from white officers who still used the n-word with regularity. His testimony also demonstrates how black officers had to walk a fine line, and how their loyalty was always in question. If they identified too closely with the black community, they drew the suspicion of whites in the department. On the other hand, just wearing a badge was enough to alienate them from the black community. These officers had unique insights on race relations and the responsibilities of law enforcement during this turbulent period, and they all expressed optimism that solutions could be found. It is too simplistic to characterize police and activists as natural enemies. In the case of the man who insulted LeRoy Swift, and the Black Panther activists who Sgt. Parker spoke of, their animosity towards the officers was occasionally not actually genuine. Instead, these interviews demonstrate the complex nature of the relationship between police and the communities they are asked to protect and serve. Detective “Tuckie” Saunders, Interview Transcript, Box 1, Folder 35, 1968 Riot Collection, LaBudde Special Collections, UMKC. Maj. Garrison and Sgt. Walter Parker, Interview with Jeanie Meyer, June 2, 1969, Box 1, Folder 31, 1968 Riot Collection, Labudde Special Collections, UMKC. LeRoy Swift, Interview Notes, Box 1, Folder 35, 1968 Riot Collection, LaBudde Special Collections, UMKC.